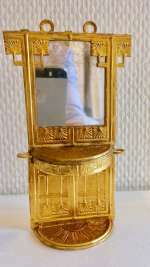 Antique lovely Ormolu Console with mirror. Erhard & Söhne.. Early Kestner plain chest with wooden knobs. Wonderful plain early Kestner Biedermeier chest of drawers 1840. 3 drawers. ca 1860. Made by Kestner Germany. All original. Wooden knobs. Empire furniture from Waltershausen, Germany. The size is: H. 7,5 cm (3") W. 10 cm (4") D. 4,25 cm ( 1 3/4"). 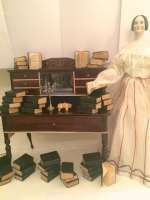 An Outstanding set of chromo-lithographed Dollhouse-furniture. A dining room and a Parlor room. Ca 1850.10 P.
It is a rare find this outstanding set of chromo-lithographed Dollhouse furniture with two suites: a dining room and a parlor room. It is made of wood with chrom-lithograped paper. the decoration is with flowers and geometric figures. It comes with 10 pieces of furniture.Very unique is the chaiselounge with a lovely design for the parlor and the wonderful large dining table, to entlarge. Also remarkable are the Etegere for displaying miniatures and the buffet. The set comes with a round table for the parlor and 6 chairs. This would be lovely for a room box. Probably made in in Germany ca 1850. Lovely condition! Size Display cabinet H. 6 1/2"( 16 cm) Dining table H. 2,3" L. 6 1/2" ( 5,8 x 16 cm) Buffet H. 4,3" ( 11 cm). Total 10 pieces. The condition is very good. Only minor wear. 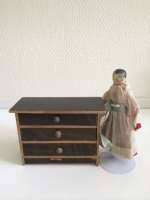 See description of this kind of furniture in: "Dollhouse Furnitur" by Margaret Towner. 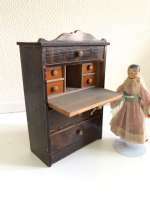 Extraordinary Early Kestner dollsize Desk. A ladys Shakespeare Library. ( 40 volumes) H. 34 cm. Germany 1860. Lovely early Empire Table made by Kestner, Germany ca. 1840. Round top. The table is in a very nice condition. The pedestal base has tree sprawling legs. A magnificent piece. All original. 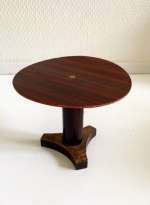 The table is 3 1/4"h. ( 8,2 cm). The table top is 3 3/4" across (9 cm). Wonderful condition. No cracks or repairs. So lovely for your early suite. 5"x 5 1/4"/ 13x14 cm good and unusually Biedermeier Secrataire/desk with mirrored back.. This is an excellent very early plain style Biedermeier furniture with shelves at each side of the desk. White banding.Scrolled carving with mirror behind.Drawer and doors to open under the desk with original knobs. Made in Germany circa 1860-70. Good condition. A great piece to add to the dollhouse living room. Do email me for further questions about this item. Empire, boulle style, Waltershausen Tyskland. 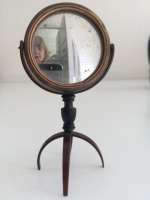 Rare Antique Tortoise shell mirror for the dollhouse. Rare Antique Tortoise shell mirror for the dollhouse. The mirror is hanging and movable. Finely carved and turned. Wonderful for dollhouse or as accessory for fashion doll. H. 3-1/2" inches/ 9 cm. Wonderful condition. All original. A very rare item Would look great on a vanity or a chest! Do email me for further questions!